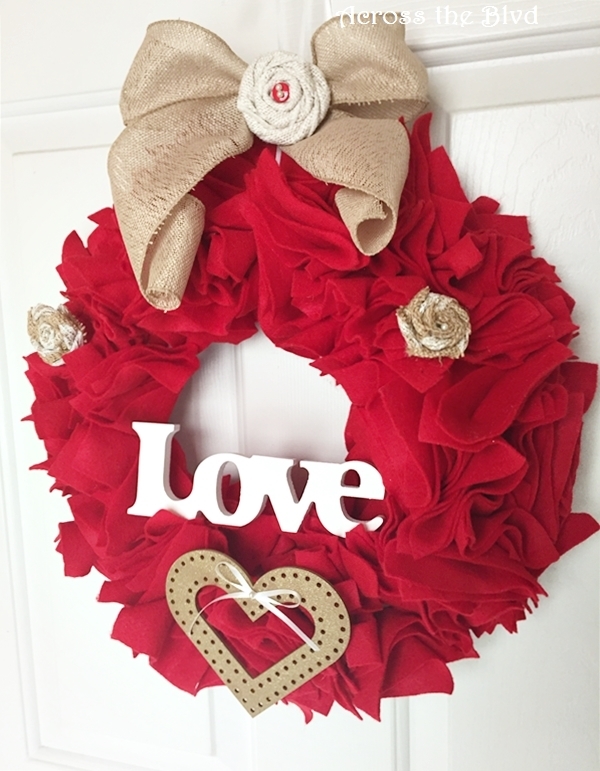 I couldn’t let too much time go by as Valentine’s Day approaches before making a new Valentine’s Day wreath. This one is super easy and can be embellished to suit your own style. I’m loving how it turned out! 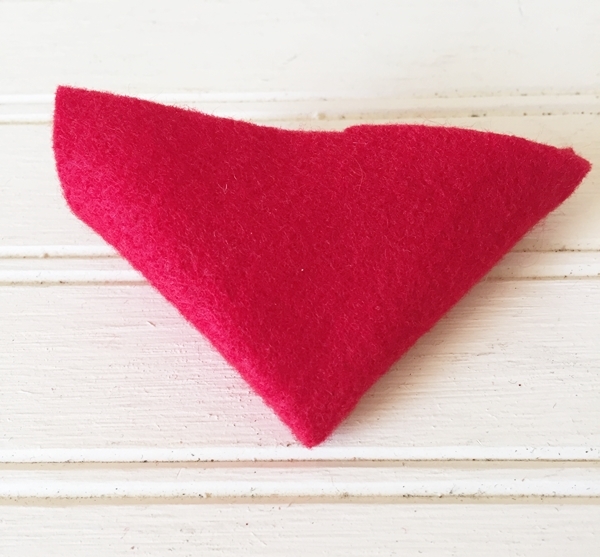 Cut felt fabric into squares, approximately 4″ in size. To make this wreath, I used 280 squares. It doesn’t matter if they aren’t exactly the same size. Close enough will do fine for this wreath. The number of squares you will need depends on what size wreath form you use. To begin making the wreath, fold a square into a triangle. Fold the triangle into another triangle and add a straight pin to the bottom. Push it into the foam wreath. The key to making this wreath look full is to keep the felt squares close together and pinned tightly next to each other. I placed squares over the top and inside and outside of the wreath. There is no need to do the back side of the wreath. Getting the desired result takes a while, but it’s so simple. It took about two hours to completely cover the wreath form. I’ve been making felt square wreaths this way for a long time, but I recently saw a lovely one made by Christie at Sparkles of Sunshine using a different method. Christie’s wreath is lovely. I encourage you to have a look! I used a thin piece of white ribbon and looped it around the top of the wreath and tied it off for a hanging loop. Using wired burlap ribbon with gold specks, I tied a bow around the white ribbon. I made a quick rolled flower from burlap ribbon, added a button and two pearl head pins and glued it to the bow. I bought a package of several hearts to use for various Valentine’s Day projects. 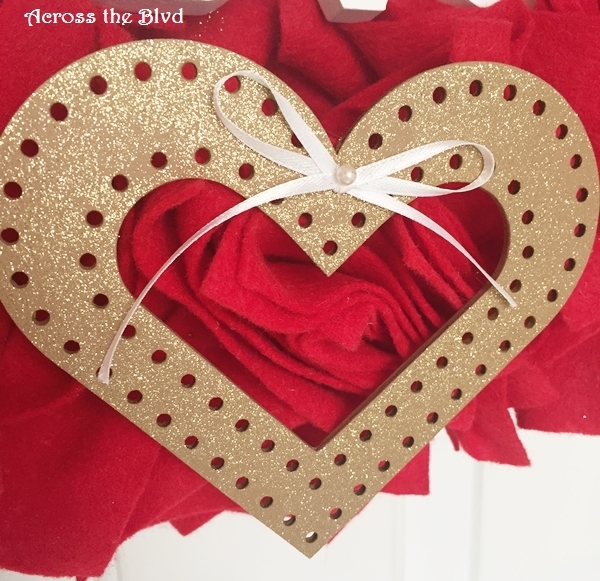 I used glittered gold spray paint for the heart. The small bow is secured with another pearl head pin. 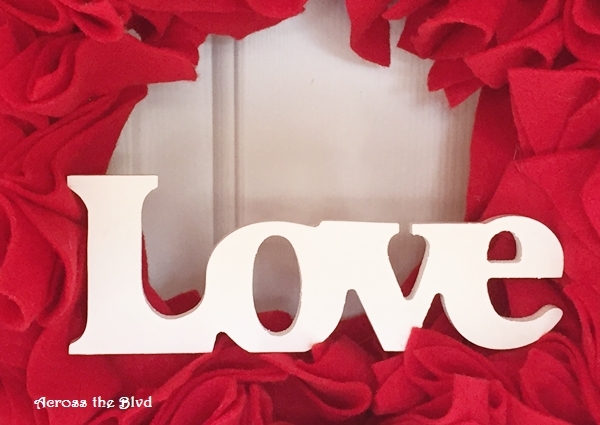 I bought the “Love” sign from Michaels and gave it a quick coat of white spray paint. The edges of it are hot glued to the felt. I love the combination of the bright red felt with the burlap and gold. This year, I’m doing my Valentine’s Day Decor in gold and red. We always have dinner at home on Valentine’s Day and each year, I try to use a different color scheme. Last year, I shared our Table for Two decor using red, silver, black and white, so it’s going to be fun changing it up this year using red and gold. 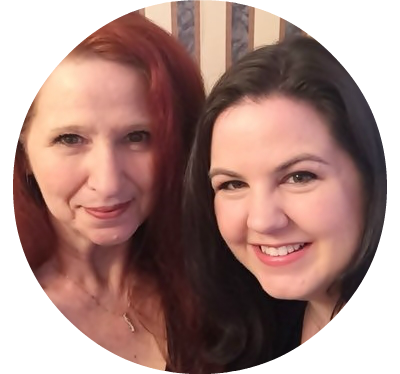 I’ll be sharing our 2016 Table for Two post on Valentine’s Day. I’m pleased to have this new Valentine’s Felt Squares Wreath as part of the decor this year. Thanks for mentioning my wreath, Beverly! I think yours is beautiful. I especially love the touch of burlap to yours. Have a wonderful week! Thanks, Christie! I want to give your method a try for the next one I make. Yours is so pretty. Hope you have a great week too. Beverly, Love the red with the burlap! I’ve been wanting to try that felt wreath technique for a while. Love how full the wreath is and the white Love stands out so beautifully with that red back drop! Very pretty! Thank you, Laurie. It’s simple to make and I love how differently one like this can look with various embellishments. Thanks! It was an easy one to put together. Very cute wreath. I love making wreaths. 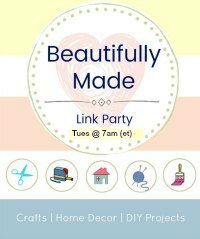 Thanks for linking up at Family Joy Blog Link up party. Hope you can join us next week. Thank you, Charlene. Wreath making is one of my favorite crafts. Thanks for hosting the party! Wow, this is such a sweet and unique wreath! I can see it being the base for a wonderful Christmas wreath too. Thanks for sharing! Thank you, Ginger. I’ve used one like it for Christmas and for 4th of July wreaths. Just changing up the embellishments can make it multi-seasonal. Thanks so much for stopping by. Thank you, Sue. Yes, we do tend to use wreaths for any occasion and season here! Thanks so much for visiting and for hosting Over the Moon. Thank you, Cara. I appreciate you stopping by! Your wreath is simply gorgeous, Beverly!! Love the rosettes and the rest of embellishments you added, it looks so pretty! Thank you so much for sharing it with us at #2usestuesday! Thanks so much, Pili! 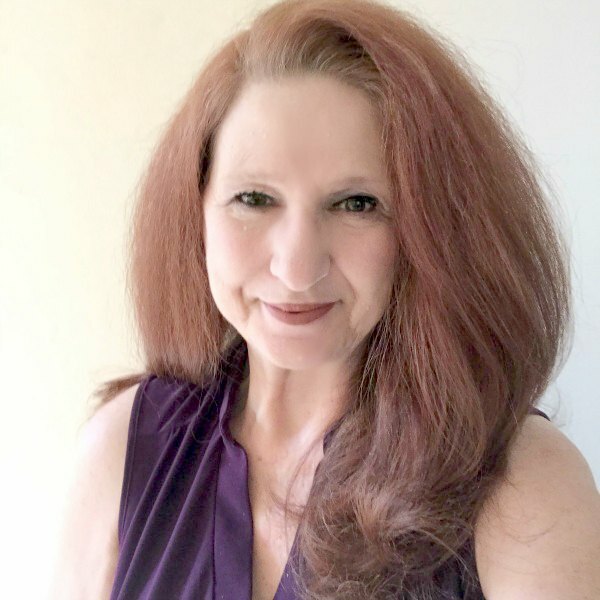 I’m always happy to share at 2 Uses Tuesday and was delighted to do so at your blog this week. Thank you, Jess and thanks for hosting! 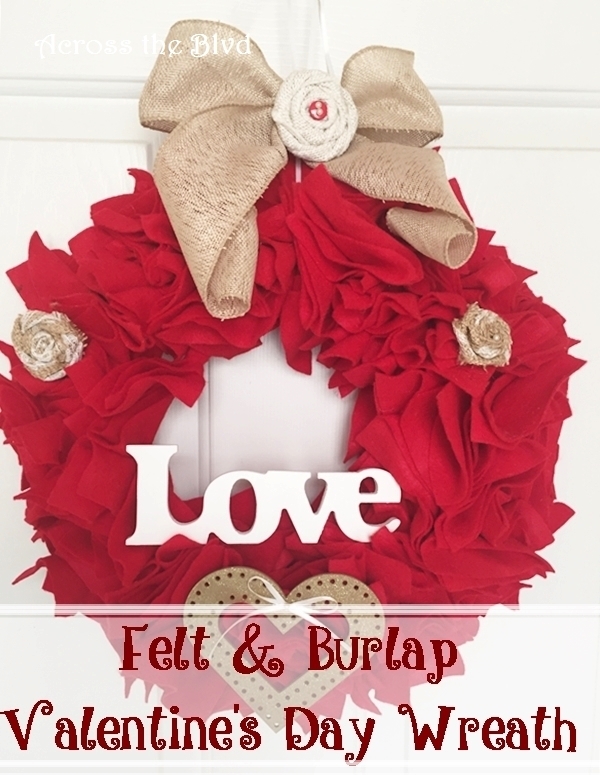 Popping over from Brag About It to thank you for linking up your beautiful wreath! Hope you are having a wonderful week! Thank you for hosting, Laurie. I appreciate your visits and shares! Thank you. Thanks for the party. 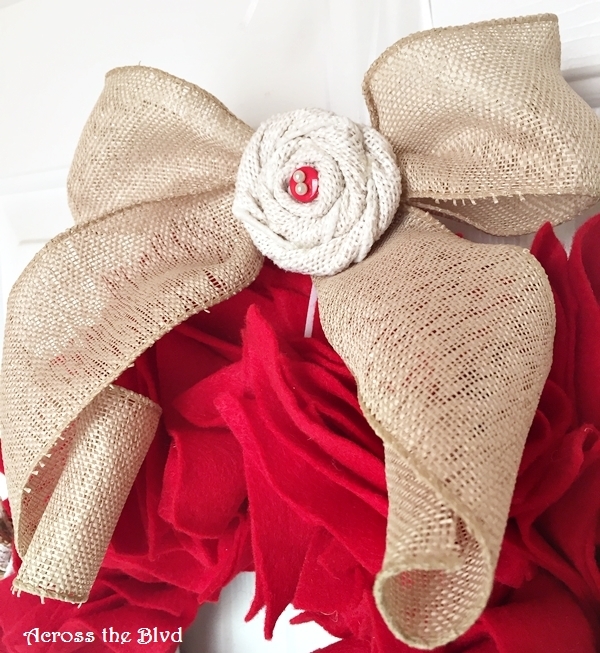 This wreath is so pretty and festive, love the combo of red with gold! Thanks for sharing at What’d You Do This Weekend?! Thanks, Joy! I’m always happy to share at your party. Thanks for hosting! I love your wreath, so simple and looks great. What a great addition to your Valentine decor!! I love making simple wreaths. Thank you! I don’t usually do a lot of decorating for Valentine’s Day, but a wreath is a must have for me. Oh my gosh, I ABSOLUTELY love this. I want to make it this year for sure. Thanks for such a great tutorial! Thanks, Lisa! I’m glad you found the tutorial helpful! This is a beautiful wreath. The vibrant red really makes it stand out. Thanks, Sherry! I don’t often used bright red in my decor, but for Valentine’s Day, it works! 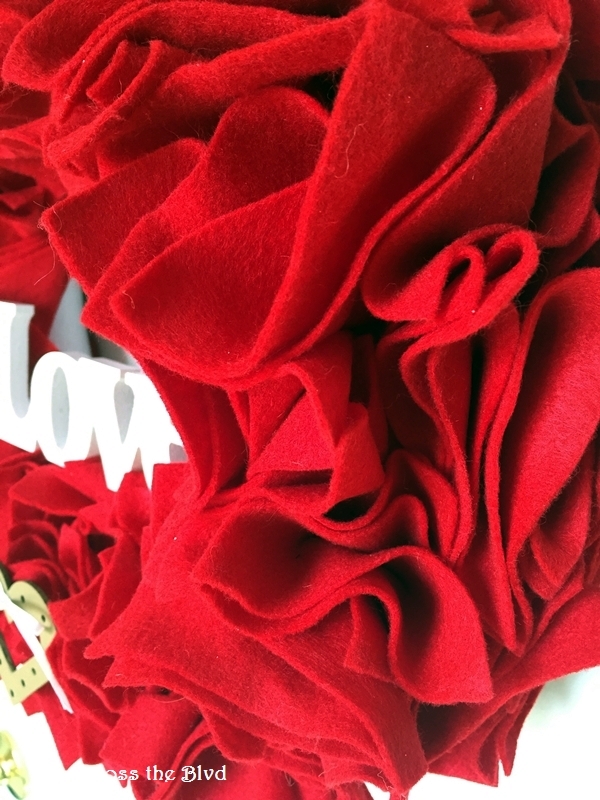 You know I love Valentine’s Day crafts because of all the red! I love love your wreath. It looks simple to do and gorgeous to display. Thank you, Darlene. It was very simple to put together and I love the bright red for this, too. Super cute wreath! I really love the rosettes! Thanks for sharing at Submarine Sunday! Thank you! Thanks for hosting a great party.